Charme Maison de Ville dans la partie historique de Saumur - L'emplacement est parfait! Cette maison de ville de bijou est idéalement situé dans le centre de la zone historique de Saumur. Il a été joliment rénové, en soulignant les caractéristiques atmosphériques uniques d'une maison de tuffeau. Toutes les salles de bains ont été récemment installé avec un style contemporain en utilisant les pièces humides '' d'inspiration asiatique ou 'douche Italienne. La cuisine est bien équipée avec de nouveaux appareils, y compris le style rétro Smeg réfrigérateur et cuisinière gamme de style. La suite principale dispose d'un dressing (placard) et une grande salle de bains. 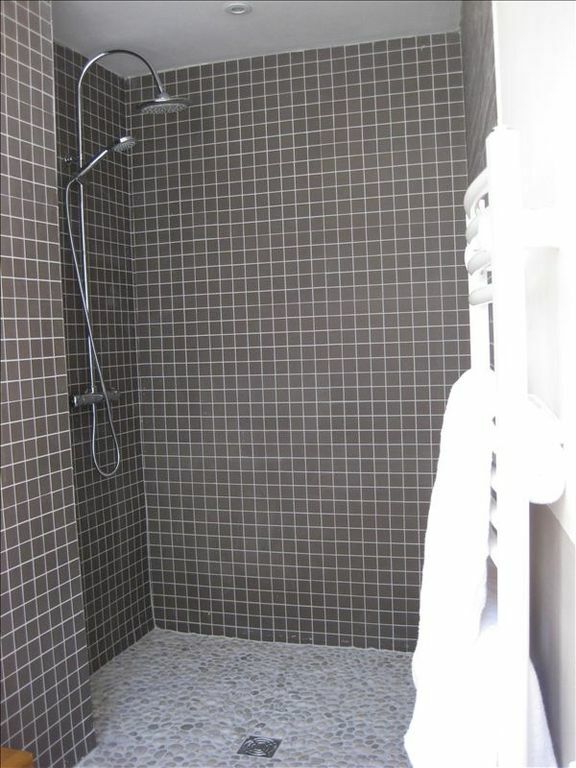 Toutes les chambres sont spacieuses et ont consacré une salle de bains. Toute la maison est lumineuse et aérée et dispose d'un bel escalier en noyer, cheminée d'origine et des poutres en chêne. Il ya une cour fermée avec salon de jardin, idéal pour manger ou boire al fresco. Sortez la porte du jardin et de marcher jusqu'à la place St Pierre pour un apéritif, déjeuner ou dîner à partir de la gamme de cafés et bistros. Notre boulanger local (boulangerie) est aussi ici pour que des croissants le matin. Si vous avez oublié des produits d'épicerie, il ya un supermarché local à moins de 5 minutes à pied ou pour un grand magasin, l'hypermarché est à moins de 5 minutes en voiture. Saumur propose également quelques boutiques uniques et des magasins d'antiquités et il ya toujours le marché alimentaire tous les samedis matin. Cette maison de ville est idéalement situé pour explorer la région, que ce soit à pied ou en voiture. Il ya de nombreux châteaux à moins d'une heure de route ainsi qu'une pléthore de vignobles, dont la plupart ouvrent leurs portes pour des dégustations de vin et des événements spéciaux. La ville elle-même détient de nombreux événements toute l'année et l'Office de Tourisme est une excellente ressource pour tout ce qui se passe dans la région. Les autres activités comprennent des promenades en montgolfière, descente en canoë sur la Loire, des balades à vélo ainsi que le spectaculaire Cadre Noir (dressage de chevaux), qui est célèbre pour Saumur. La région est idéale pour des vacances reposantes ou pour vous tenir occupé - ce que vous êtes d'humeur à faire. Alors détendez-vous dans notre belle maison! Il est le cadre idéal pour des vacances agréables. Mots-clés: Charmante maison de ville dans le centre historique de Saumur à distance de marche du château et de la Place St Pierre. Notre maison a maintenant wifi. I spent a lovely 2 week holiday in this property. House itself is very nice - well laid out, all the rooms a good size. House is about 100 years old and has character, but bathrooms and kitchen are all modern and high spec. No garden but there is a small courtyard which is private and fine if you just want to sit outside in the evening. Saumur itself is a very nice town, plenty to do with lots of cafes. During summer there were a number of events put on and it was very lively during our stay. There is a swimming lake a short drive away which is good for queries. Owner is very helpful and responded quickly to any questions and resolved issues very quickly without any fuss. Thank you. Glad you like it as much as we do! owners could not be more helpful. Thanks Brendan, so glad you enjoyed it. We love it for the same reasons! Hope to welcome you again some day. Good central location in a very pleasant town. A good location in the town centre close to restaurants, shops, the castle and the river. Plenty of interesting places to visit nearby but you will need a car. Excellent town to stay in. Parking near the property is problematic but there is a large free car park about 10 minutes walk away, straight down the road the house is in. The house has a large sitting room and dining room. It is spread over 3 floors so you will be doing a lot of going up and down. Warning: there is nowhere to store clothes in two of the bedrooms. Okay if you are happy to live out of a suitcase but annoying if you are not. There is a large amount of storage in a corridor but it is only accessible through the third bedroom. It was very hot weather when we were there and difficult to keep the rooms cool. No fans provided. Noisy if you opened the windows. The street cleaners come round making a row very early each morning! Overall a good place to stay but some clothes storage in the bedrooms would make it better. Thank you Chris for your review and for the valuable feedback. The problems with living in the middle of town is unfortunately the noise from time to time. However, we take your feedback seriously and will provide future visitors fans, especially in this hot heatwave Europe seems to be having. We are also in the process of getting some wardrobe storage in the other two bedrooms. We agree that the Saumur house is in the perfect location. It was just right for quick shopping. After entering through the small courtyard overhung with a beautiful trumpet vine, you appreciate how the house fits in the historic surroundings. On three levels linked with an exceptional wooden staircase, we admired how stylish contemporary plumbing and appliances were used to enhance the high ceilings of 100 years ago. Our party of five retirees was most comfortable here and made good use of the excellent food shopping within a five-minutes walk. Saturday morning at the Place St. Pierre was not to be missed. Bought super-fresh small Dover sole and rabbit thighs as well as delicious local melons. Owner was most responsive and courteous in all communication. Gives you helpful advice and good lists of restaurants and nearby sights. Thank you for your feedback, we love the property for the exact same reasons! Glad you enjoyed your time there. The location was great for us. Pick up fabulous pastry during the morning jog and finish the dinner wine without designated driver worries. Street noise was minimal beyond early morning street cleaning. House stayed surprisingly cool during several days of 90+ F temperatures. We had one morning without hot water and the owner was remarkably responsive in having the matter remedied. Plenty of hot water thereafter. Loved having the kitchen and patio to cook up meals from the market instead of just gawking at the produce. (My first attempt at quenelles was I thought pretty terrific.) The house is clean, adequately furnished and in good condition. Solid wifi. Closet space is ample on the top floor but otherwise limited. Overnight garage parking is very inexpensive and street parking was generally available. Would be happy to rent the property again; felt it was a reasonable value. Thank you Madeliene for making it ours for a week. Thank you for your review, glad you enjoyed it. That's exactly what we love about where our house is and yes the natural stone makes it cool in summer in warm in winter! Again apologies about the lack of hot water one morning, glad we got it resolved quickly. We loved our week in Saumur at the lovely Homeaway from home! We had everything we needed in a comfortable and convenient location. Just a few steps away from Place Saint Pierre where the Saturday market takes place as well as a bunch of great restaurants. We hardly ventured away from there for dinner. Thanks Madeleine for allowing us to experience this special place! I am so pleased you enjoyed it as much as we do. Ambiance and location was one of the key reasons for us choosing the property. Thank you for your review. Dégustation de vins région, de nombreux châteaux de la Loire au sein de la marche et la distance de conduite. Cadre Noir (le plus grand de dressage de chevaux dans la région) sur la même route. L'emplacement est fantastique pour une véritable expérience française.